Home owners living in the Hartland Township in Michigan that need roof repairs can call Livingston Roof Pros for professional roofing services at competitive pricing. We offer full roof replacement and roof repair in Hartland Michigan and surrounding areas and we’re one of the top rated roofing companies in the area. In this article I’ll explain some of the things that show why we’re better than other roofing contractors in Hartland Michigan. At Livingston Roof Pros we focus on quality work and a great customer experience. We realize that for many home owners getting roof replacement or roof repair in Hartland Michigan is not something that happens often and many times it’s a very confusing time for residents. That’s why we work closely with our customers to explain everything we’re doing on their roofs and also let them ask questions and get a clear understanding of any repairs, our processes, and everything else we do. We pride ourselves on having the best customer service when it comes to this area and we do everything we can to make sure you’re completely happy with your new roof installation or roof repair in Hartland Michigan. Talk with one of our roofing specialists today to learn more about our services or just to ask us a question about your roof. We’d be happy to help! Talk with one of our roofing specialists today to learn more about our services or just to ask us a question about your roof. We’d be happy to help! As you can see, we can completely make your roof back to new again. Our services can help you not only get a new roof but also confidence that the project was completed correctly by our roofing experts. Whatever type of roof service you need in the Hartland Michigan area can be done by Livingston Roof Pros. One of the reasons why so many people have problems with their roofing contractors is that they hire a roofing contractor that isn’t licensed or even qualified for the project. What’s worse is that the roofing company may not be insured and if something happens it can mean huge problems for you. 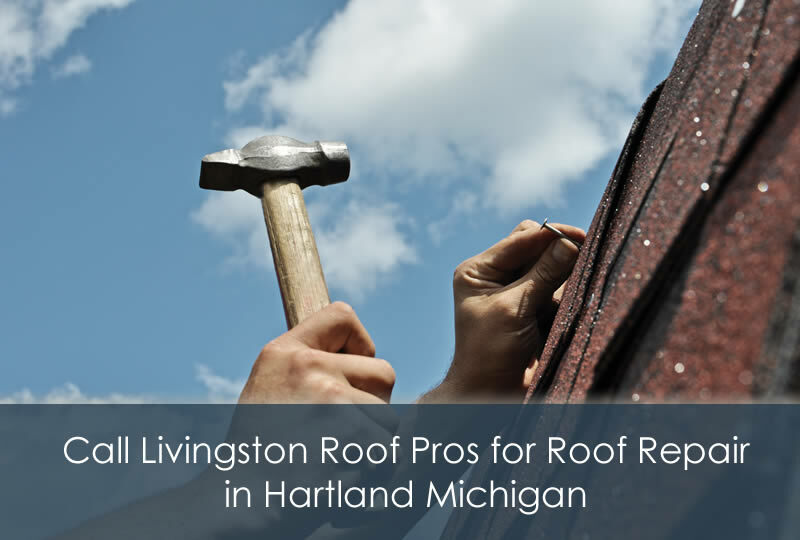 At Livingston Roof Pros however, we are fully licensed and insured to work in Hartland Michigan and surrounding areas. We’re also fully qualified to repair or install new roofing on your home in a variety of roofing systems. Roofing material manufacturers require roofing companies to get certified before installing their products to ensure they are properly installed or repaired when needed. That’s why at Livingston Roof Pros we are fully qualified on many of these roofing systems and we install the roofing per the manufacturer’s specifications to ensure your warranty is good and honored by the manufacturer. At Livingston Roof Pros we also can offer roof replacement or roof repair on a variety of roofing systems including asphalt shingle roofing and metal roofing. Even the not-so-common tile roofing that is on a few homes is something we can repair or replace. We also can install and repair the difference types and brands of these roofing materials as well including three tab shingles, roll roofing, architectural shingles, and impact resistant shingles if you have asphalt shingles installed on your home. If you have a roofing problem that’s occurring on your home now and you need roof replacement or roof repair in Hartland Michigan be sure to call Livingston Roof Pros today to learn more about our services and to get a free estimate on your roofing replacement.